Is this the best pedal under $50? Nylon pedal is more impervious to scratches. 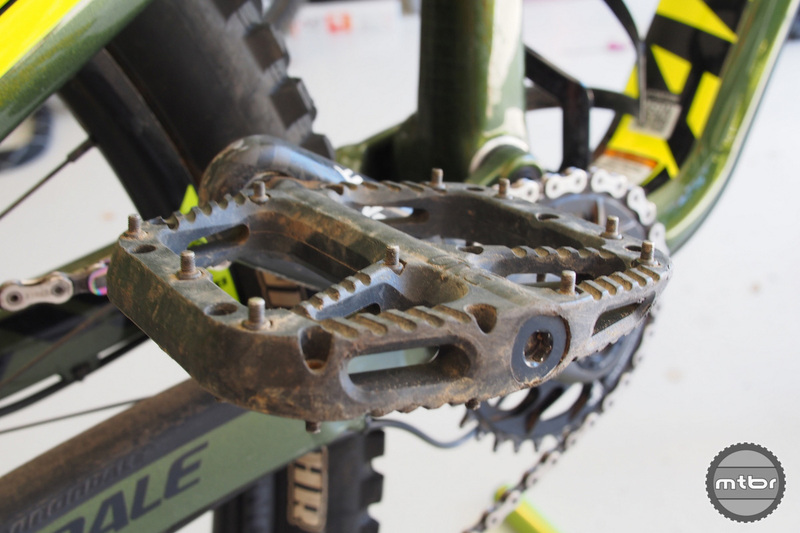 There’s been a lot of development in the flat pedals category in recent years as riders have migrated towards this option to better explore the world of unclipped riding. Flat pedals improve the safety margin for most riders as they’re able to handle more technical terrain without being locked on to the bike. Flats also improve the skill set of the rider as they learn to stay connected to the bike without being attached to it. Excelled in the gnarly terrain of Moab. OneUp Components introduced two pedals recently, an aluminum one for $125 and this composite model available at $48 a pair. We’ve been fascinated with this composite pedal not only because of its low price but also because of our experience with composite pedals absorbing rock blows without jarring the rider and without showing much damage to the pedal. OneUp Composite pedal and Race Face Chester side by side. Pins are long and grippy. 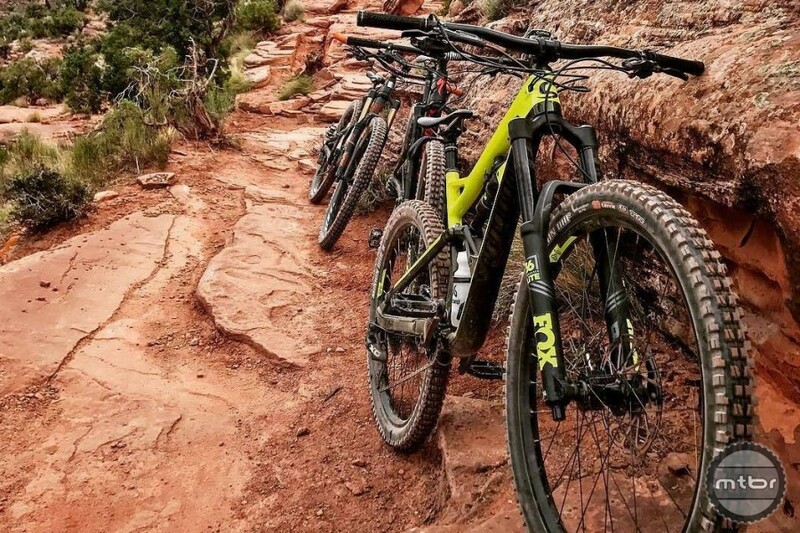 We rode this pedal in our local forests and felt confident enough to take it on a 10-day road trip to Moab and Fruita. The pedals performed flawlessly and just seemed to get better with time as they spun more freely and the edges were smoothed out. The best thing about them is the grip. Heel down, heel up or pedaling out of saddle, the pedals always provided reliable and predictable grip. They felt very natural with FiveTen Freerider Pro shoes. These shoes don’t have the stickiest sole available but they were a perfect match with the OneUp shoes providing pedaling efficiency and grip. 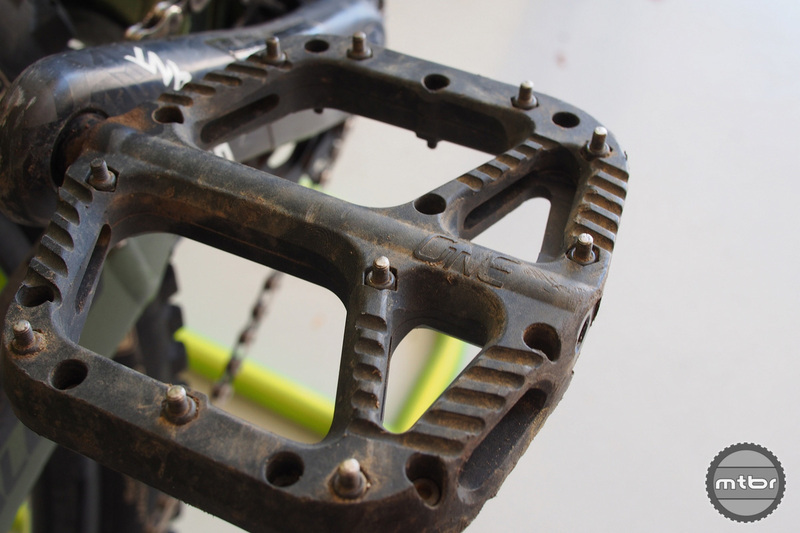 The platform is big at 115×110 without being too big as it extends the pedaling surface close to the crank where the axle meets it. 10 long, removable pins are placed at the outer edges and on the middle of the pedal. The platform is fairly open so although untested in our road trip, we can see that this pedal will shed mud well. Edges are chamfered as well to deflect obstacles and rock hits. Aside from being more affordable compared to aluminum pedals, nylon pedals seen to ride better in the rocks. 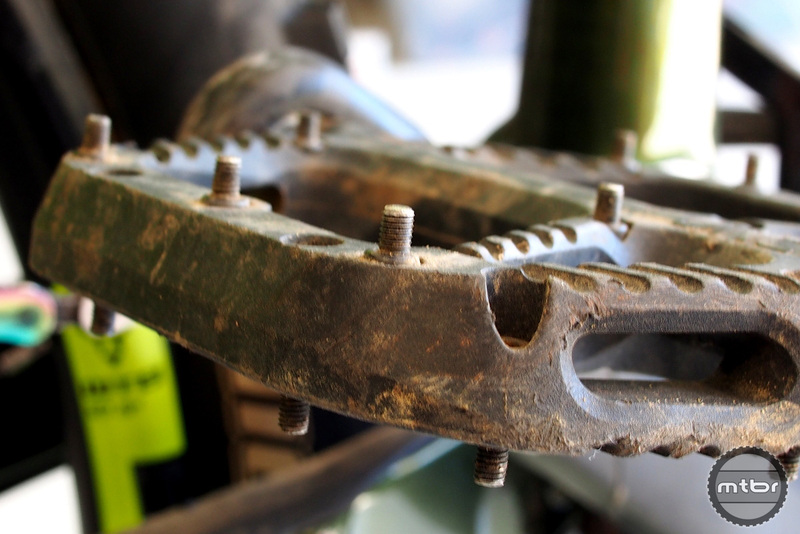 During those inevitable rock hits, they absorb some of the shock and vibration thus reducing the fatigue to the rider. And clean them up a bit and the scratches seem to disappear on the nylon surface. 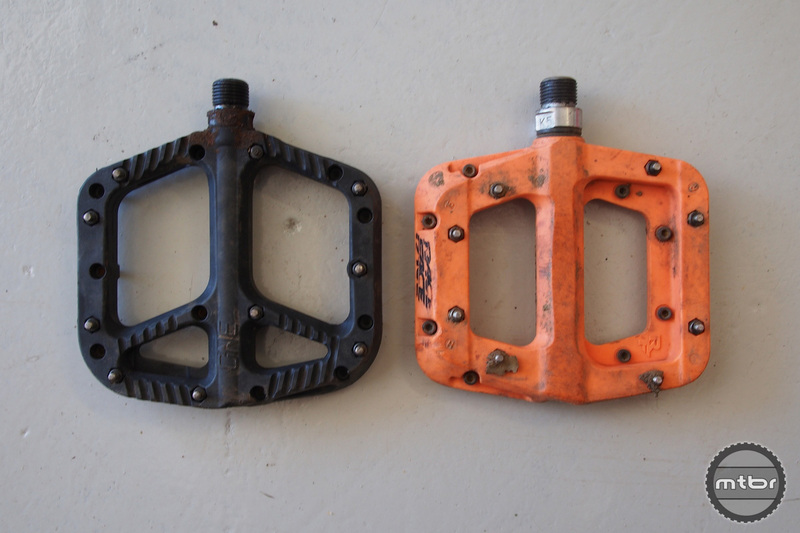 Are they better than the venerable Race Face Chester pedals at $55? Yes! They weigh exactly the same at 360 grams but the OneUps deliver much more grip. The platform is a touch bigger and the grippier, longer pins are positioned better. And it has a more open, mud-shedding design. 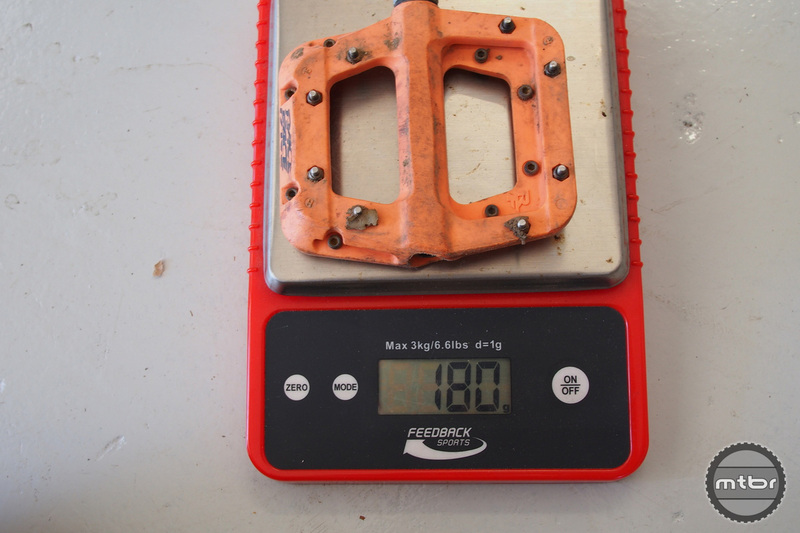 OneUp Composite pedal weighs 180 grams each as well. 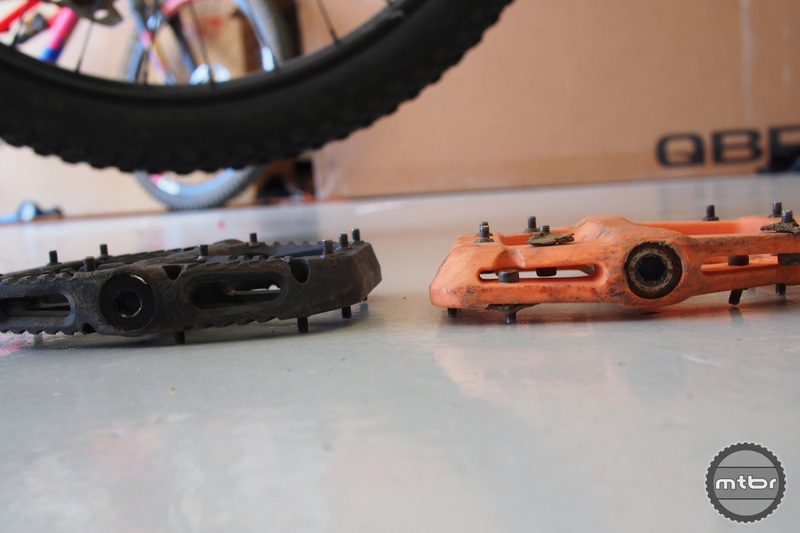 OneUp and Race Face pedals are about the same thickness. Race Face Chester weighs 180 grams each. 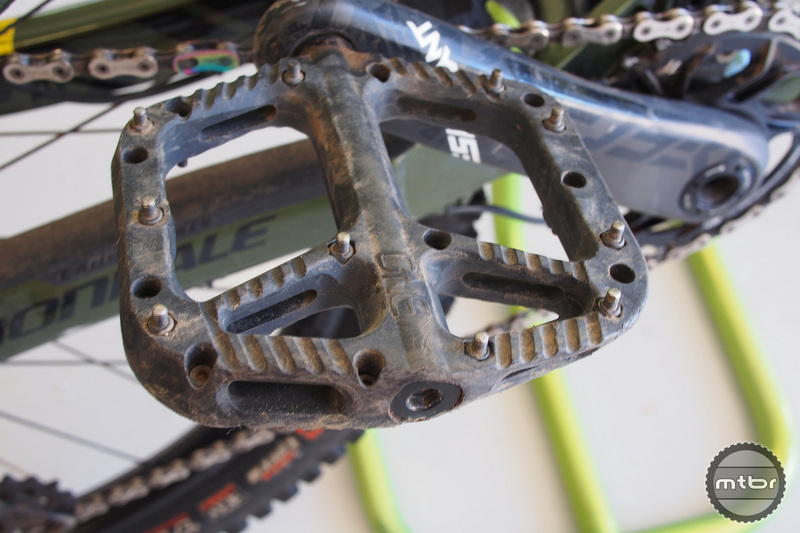 OneUp pedal extends closer to the crank. OneUp pedal after big Moab road trip. Pins on the middle of the pedal deliver more grip. 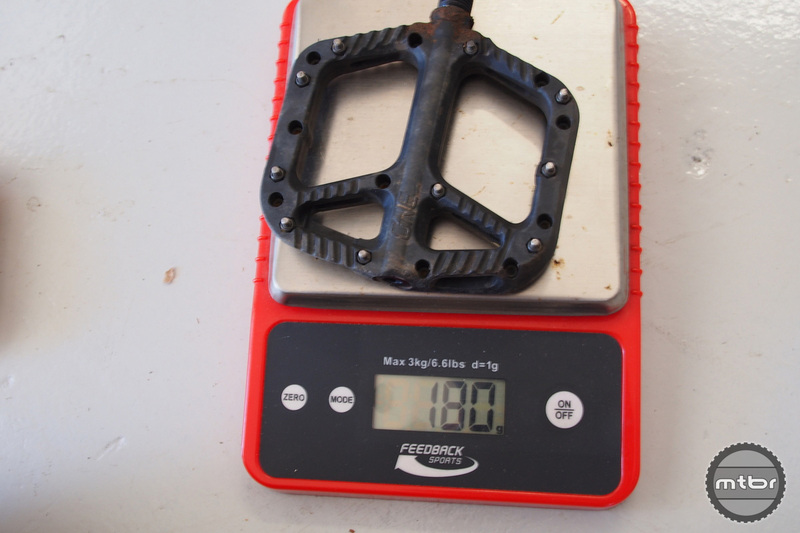 These pedals weigh 180 grams each. I’m fascinated by how flat pedals are becoming all the rage. I tried clipless for mountain biking, but never liked the feeling of being “fastened” to the bike. I would happily give the OneUp Comps a go – they look like more than a match for the Kona Jackschitts that I used. The biggest difference will come down to pedal strike frequency and rider impact. 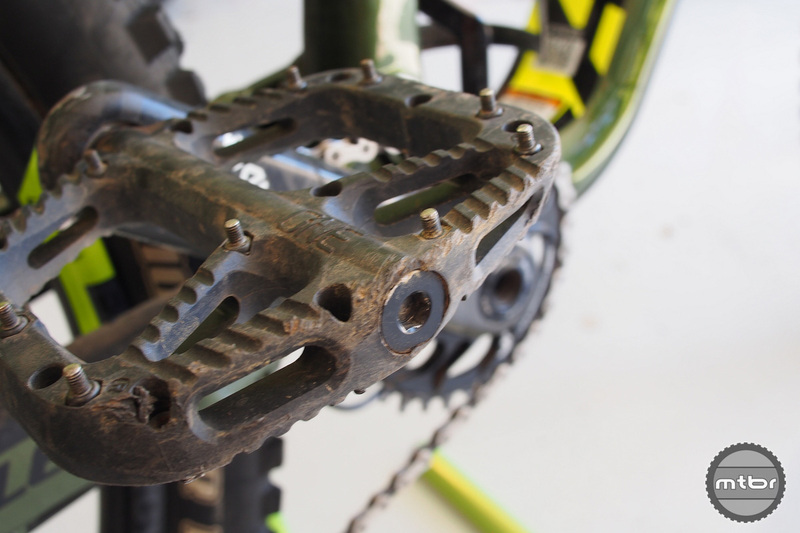 The alloy pedals are 5-6mm thinner and will strike fewer rocks, but the rider impact with composite pedals will feel lesss harsh. I guess? Ultimately, which version will help prevent significant strikes the best? You’re going to smack your pedals on rocks eventually. The aluminum pedals may be thinner, but the aluminum will grab onto rocks. The nylon is thicker, but when you do hit a rock, it hits and slides way better than aluminum. The nylon will also absorb some of the vibrations when you hit a rock, keeping you mostly in control. Also, the nylons are only $48. 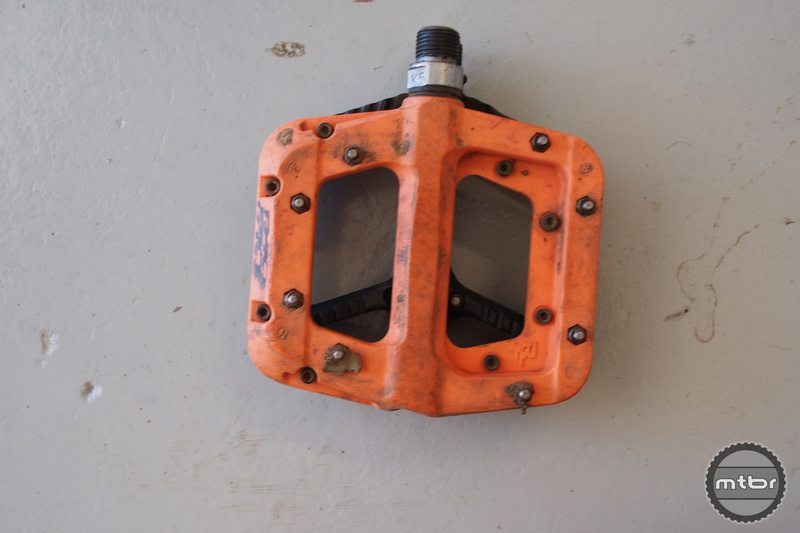 I bought a set of Crankbrothers Stamp pedals at the start of this season to experiment with platform pedals, after years of riding with SPD clips (and anxiety over low-speed stall-falls). After several months of anxiety-free riding, I’m pretty much sold on platforms. Looking at all the damage on the Stamps, and considering how much more frequently I pedal strike with the platforms (probably due to both the larger pedal size, as well as different pedaling technique due to being unable to pull up on the pedal), I’m becoming convinced that materially cheap(-er) constructions (ie composite instead of metal) that still have good design (lots of pins per side that are back-side turnable) is the best approach to the platform pedal. I’ve found my next platform pedal. How would these Composite Pedals be for Road Commuting ? I do not MTB. I am strictly a Road Commuter up to 100 Miles round trip . And, also, is the Spindle 9/16″ ? And, can they accept a Strap if needed.